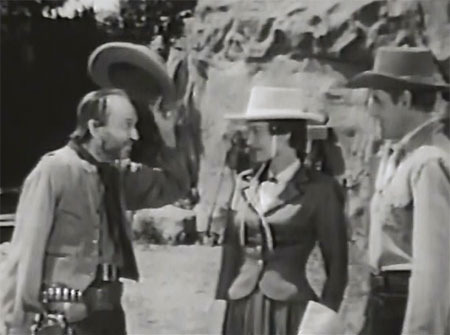 Above: William Fawcett in his best-known screen role–cowboy Pete Wilkey on the 1955-1960 Fury TV show. Well-remembered for his later television turns as cranky, cheerful, or roguish old-timers, William Fawcett devoted many of the earlier years of his character-acting career to playing similar roles in chapterplays. Fawcett made almost all his serial appearances in producer Sam Katzman’s post-war outings for Columbia Pictures–using his stern and wizened features, wry grin, and nasal but gruff-sounding voice to excellent advantage in portrayals of grim dignitaries, cunning rascals, crotchety scientists, and grizzled frontiersmen; his lively and assured performances greatly augmented the entertainment value of Katzman’s low-budgeted and generally mediocre chapterplays. William Fawcett Thompson was born in High Forest, Minnesota, the son of a Methodist minister; he became interested in acting at an early age, frequently performing in church plays during his childhood and his teenage years. He graduated from Minnesota’s Hamline University in 1916, and soon afterwards joined an ambulance corps that served in France during World War 1. Although he had received a Methodist preaching license shortly before leaving for France, he decided to pursue an acting career instead of a ministerial one upon his return to America in 1919; he spent most of the 1920s touring the Midwest and parts of Canada as a member of various theatrical companies. He left the stage sometime in the early 1930s to attend the University of Nebraska, graduating with a Ph.D. in Elizabethan drama in 1936; he then moved to Michigan State University, where he embarked on a career as a teacher of Theatre. However, the old acting bug bit Professor Thompson again around 1945, causing him to leave Michigan State and head for Hollywood to try his hand in the movie business. 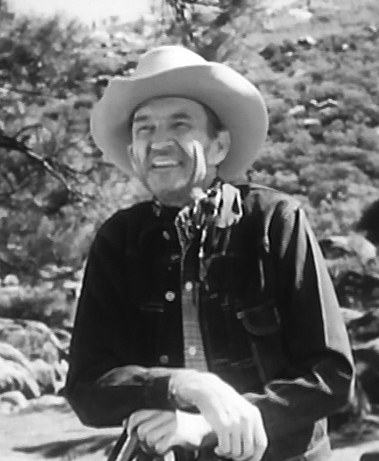 Dropping his last name, he made his screen debut as “Bill Fawcett” in the 1946 PRC B-western Tumbleweed Trail, in which he played a small role as a judge. 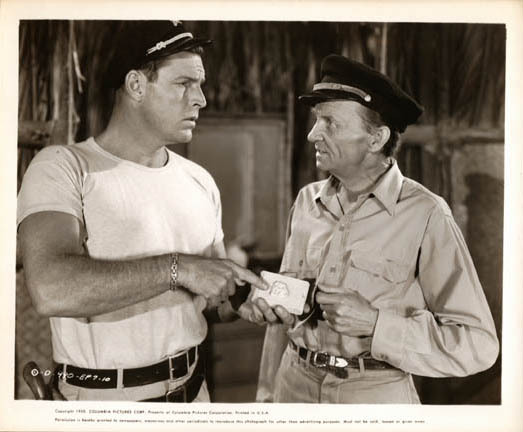 Fawcett would work chiefly for low-budget PRC and for Sam Katzman’s (somewhat) higher-budgeted Columbia serial factory during the second half of the 1940s, playing character roles that increased in size as the decade advanced; his first Katzman outing was The Sea Hound (Columbia, 1947), a tropical adventure serial filmed on Catalina Island. Fawcett’s participation in this chapterplay was minor; he made occasional appearances as an intelligent French doctor-turned-beachcomber named Andre, who periodically gave important information to hero Buster Crabbe in exchange for pipe tobacco. Fawcett played this colorful part with an enjoyable combination of quirkiness and cheerfulness, although his attempt as a French accent was not particularly convincing. Above: Buster Crabbe and William Fawcett in The Sea Hound (Columbia, 1947). 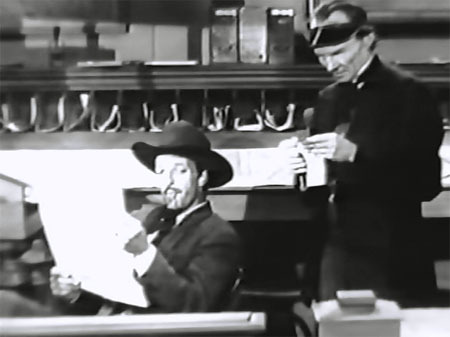 Fawcett’s second serial, Tex Granger (Columbia, 1948) gave him a larger but less sympathetic role than Sea Hound; as Lowery, the shrewd and shifty clerk of crooked town boss I. Stanford Jolley, he participated in some scheming sessions, collected taxes in flinty and shyster-like fashion, furtively oscillated between the rivals camps of Jolley and crooked marshal Smith Ballew, and made a last-chapter confession that resolved a key subplot. His next two chapterplays were Superman and Congo Bill (both Columbia, 1948); in the first, he had a literal walk-on as a henchman posing as a news-hawker, while in the second he had a single scene as a weather-beaten jungle guide named Blinky, who gave Congo Bill (Don McGuire) a tip on the lost heiress and the hidden native tribe he was looking for–but was murdered (offscreen) immediately afterwards, by villains who didn’t want him to lend the hero any further help. Above: William Fawcett tells I. Stanford Jolley of an impending gold shipment in Tex Granger (Columbia, 1948). 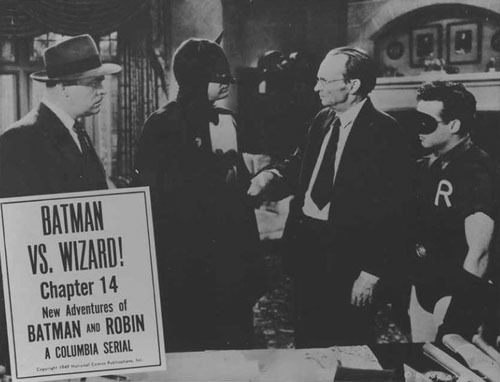 Batman and Robin (Columbia, 1949) was the first serial in which Fawcett played a really prominent part; he was cast as Professor Hammil, a reclusive, wheelchair-bound, and bad-tempered inventor whose valuable remote-control machine was stolen by a masked villain called the Wizard–and who was suspected of being the Wizard himself by Batman and Robin (Robert Lowery and John Duncan). Though his character turned out to be a red herring, Fawcett received a good share of screen time as the incredibly irascible Hammil, and played the part with irritable gusto–railing at the police for allowing his invention to be stolen, snapping at anyone who tried to ask him questions, and denouncing any invasion of his privacy. The scientist also possessed a secret rejuvenation chair that temporarily cured his paralysis–allowing Fawcett to adopt a positively deranged expression as his character absorbed the chair’s electrical rays. 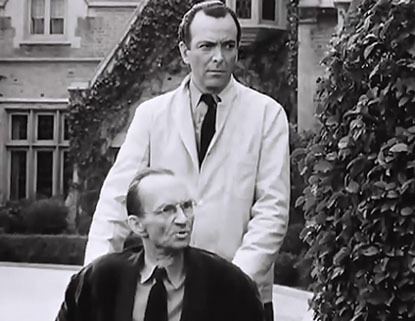 Above: Professor Hammil (William Fawcett) rebukes the off-camera Vicki Vale (Jane Adams) for trespassing on his property in Batman and Robin (Columbia, 1949). Hammil’s attendant is played by Leonard Penn. Above: Lyle Talbot (as Commissioner Gordon), Robert Lowery (as Batman) and John Duncan (as Robin) confront William Fawcett in Batman and Robin. The Adventures of Sir Galahad (Columbia, 1949) featured Fawcett as the famed Merlin the Magician, who both hindered and helped aspiring knight Galahad (George Reeves) in his quest to recover King Arthur’s stolen sword Excalibur. Galahad was an interestingly offbeat serial, albeit flawed in many respects; most damagingly, the writers never came up for a convincing explanation for Merlin’s contradictory behavior. Although the old enchanter tried to kill Galahad in the first chapter and often seemed to be working against King Arthur, he confidently claimed in the last chapter that all his actions were intended to aid the King’s cause. Inconsistent though his character was, Fawcett delivered a memorably lively and larger-than-life performance in Galahad, stealing many scenes; he delivered grim prophecies in imposingly ominous fashion, uttered sinister spells in gleefully fiendish style (“Spring up, flames of darkness!”) and conveyed a delightful slyness that made his wizard seem one step ahead of all the other characters. 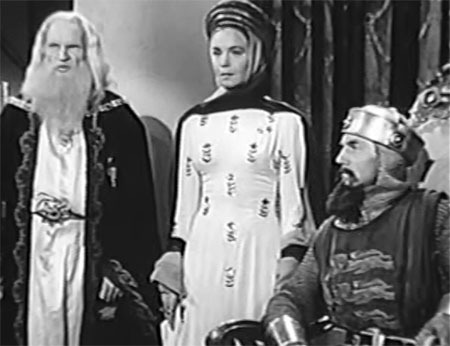 Above: William Fawcett as Merlin predicts that the disappearance of Excalibur will bring doom upon Camelot, to the dismay of Pat Barton (as Morgan le Fay) and Nelson Leigh (as King Arthur) in The Adventures of Sir Galahad (Columbia, 1949). 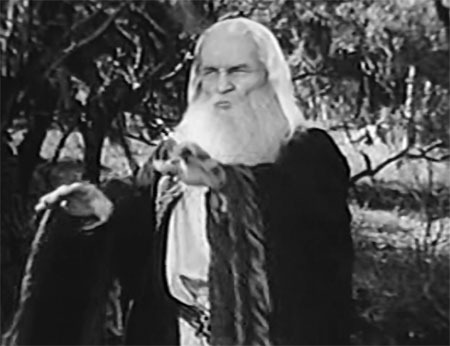 Above: William Fawcett casts a spell on the off-screen George Reeves in Adventures of Sir Galahad. Cody of the Pony Express (Columbia, 1950) cast Fawcett as Ezra Graham–the father of the leading lady (Peggy Stewart) father, the proprietor of a Pony Express way-station, and the most comical of the actor’s many serial characters. That said, Fawcett’s garrulous and easygoing Ezra did provide heroes Jock Mahoney and Dickie Moore with good-natured assistance throughout the serial–when he wasn’t trying to avoid his domineering wife (Helena Dare), who continually berated him for his lackadaisical ways. Fawcett made his character’s gabbiness, his carelessly laid-back attitude, and his repeated encounters with his short-tempered spouse quite amusing, providing Cody with above-average comedy relief. Fawcett followed this major role with a bit as the Mayor of Metropolis in Atom Man vs. Superman (Columbia, 1950); he appeared in just one scene, introducing Superman (Kirk Alyn) at a ship-launching ceremony and then displaying concern when the Man of Steel sudden succumbed to Kryptonite wielded by the villains. 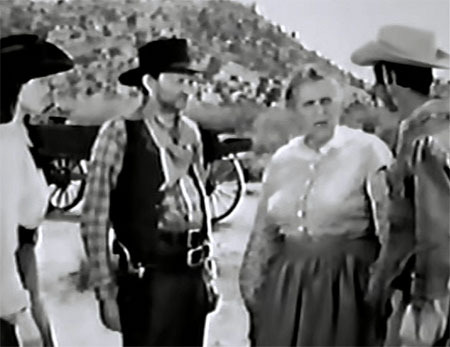 Above, left to right: Peggy Stewart, William Fawcett, Helena Dare, and Dickie Moore in Cody of the Pony Express (Columbia, 1950). Above: William Fawcett grumbles about a troublesome wagon delivery to Peggy Stewart in Cody of the Pony Express. Pirates of the High Seas (Columbia, 1950) was a sort of unofficial followup to Fawcett’s first chapterplay The Sea Hound; like the earlier outing, it was filmed on location in Catalina and starred Buster Crabbe. Fawcett’s role in Pirates–that of a beachcomber named Ben Wharton–was also similar to his one in Hound, although much larger. His character, an ex-Navy man gone native in the Pacific Islands, figured prominently in three of Pirates’ episodes; he first saved the heroes from hostile islanders by virtue of his office as the island witch doctor, and then became involved in a hunt for missing diamonds originally stolen by a wanted Nazi war criminal. After discovering that the old ivory cigarette case he possessed held an important clue to the gems’ location, Wharton attempted to beat both heroes and villains to the prize–but eventually got murdered by the Nazi fugitive Von Hausdorf, who was still looking for his wartime loot. Fawcett effectively conveyed both grimness and laconic wiliness in this role–ordering the natives around with menacing sternness, coolly lying to the good guys, and just as coolly bargaining with the bad guys. Above: Buster Crabbe and William Fawcett examine a valuable cigarette case in a publicity still for Pirates of the High Seas (Columbia, 1950). In 1951, Fawcett played a key supporting role in the Gene Autry B-western Hills of Utah, the first of many assignments for Autry’s “Flying A” production outfit; over the next few years, he would appear many times on the Autry-produced TV series The Gene Autry Show and The Range Rider. He also began appearing in small feature-film character roles for studios like Universal, Paramount, and Allied Artists—but retained his place in Katzman’s serial stock company. Roar of the Iron Horse (Columbia, 1951), one of Katzman’s few really good serials, gave Fawcett his first official “sidekick” role; as an old prospector named Rocky, he helped undercover lawman Jim Grant (Jock Mahoney) deal with two different gangs of railroad-wrecking outlaws. Fawcett managed to make Rocky quite funny without ever making him seem stupid; he bragged, grumbled, and wisecracked to very entertaining effect, but toughly and capably assisted Mahoney in chases and gunfights. 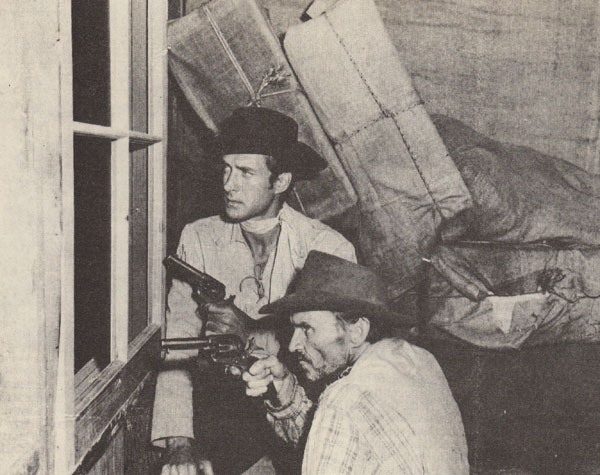 Above: William Fawcett banters with Hal Landon (center) and Jock Mahoney in Roar of the Iron Horse (Columbia, 1951). 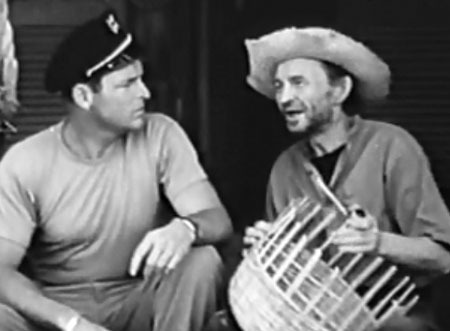 Above: Jock Mahoney and William Fawcett in Roar of the Iron Horse. Above: William Fawcett leads a band of Tharan rebels in Captain Video (Columbia, 1951). The scenes taking place on Tharos were tinted green in Video (to make Tharos look different from Vultura’s red-tinted planet of Atoma and the black-and-white Earth), hence the coloration in the above image. King of the Congo (Columbia, 1952), handed Fawcett an even more offbeat part as the unnamed High Priest of an ancient and isolated white African tribe called the Rock People. 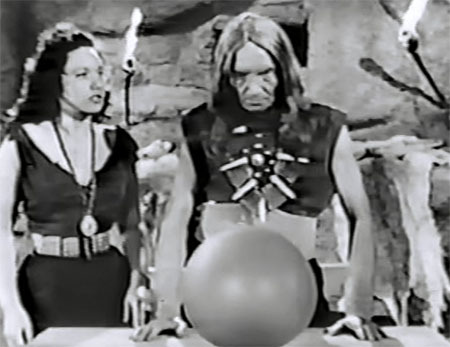 His character repeatedly used a mystic crystal ball to keep abreast of past and present happenings, and continually had to persuade his impetuous and suspicious fellow-tribesmen to put their trust in hero Buster Crabbe—a stranded US Air Force pilot battling a group of Communist conspirators in the jungle. As in Captain Video, Fawcett played his part with a solemn dignity that minimized the character’s more ludicrous aspects. Above: Gloria Dea watches as William Fawcett searches his magic crystal in King of the Congo (Columbia, 1952). Blackhawk (Columbia, 1952) featured Fawcett as Dr. Rolph, a scientist who invented a powerful “electronic combustion ray” that was sought by a spy ring headed by Laska (Carol Forman); his character was kidnapped by the spies but rescued by the heroic aviator Blackhawk (Kirk Alyn). Fawcett had limited screen time here, but made the most of it; his absorbed and serious manner as he demonstrated his machine and his brusquely self-important reaction when confronted by Laska and her men (“see here, young lady”) were both convincingly professorial—not surprisingly, given Fawcett’s university background. 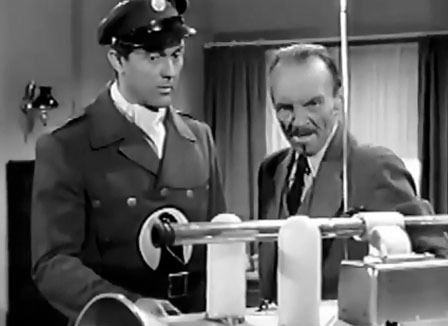 Above: William Fawcett shows his ray machine to Kirk Alyn in Blackhawk (Columbia, 1952). Fawcett began concentrating more and more on television work as the 1950s progressed, playing a recurring role on the short-lived Duffy’s Tavern TV series (which aired in 1954) and frequently guesting on other series like the aforementioned Flying A shows, The Roy Rogers Show, and The Adventures of Kit Carson. Perhaps as a result of this expanded TV schedule, his next serial appearance was a brief one; he popped up in one chapter of Gunfighters of the Northwest (Columbia, 1953) as a henchman guarding the villains’ secret mine. Later in 1953, Fawcett appeared in his only non-Katzman chapterplay, Republic Pictures’ Canadian Mounties vs. Atomic Invaders, which gave him a miniscule bit as an old trapper named Murphy. 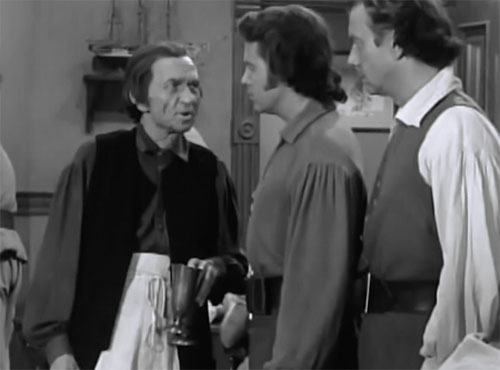 Fawcett returned to Katzman’s Columbia serial unit for The Great Adventures of Captain Kidd (once again, 1953), in which he made three brief appearances as a friendly innkeeper. 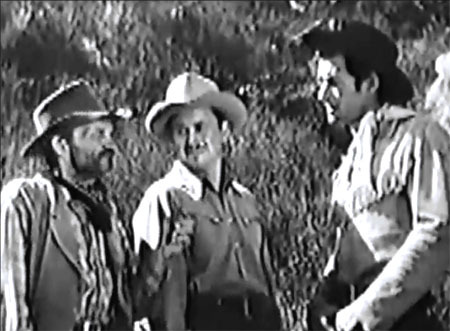 Above: William Fawcett gives some information to Richard Crane (center) and David Bruce in The Great Adventures of Captain Kidd (Columbia, 1953). In 1954, Fawcett made his final serial–Columbia’s low-budget and stock-footage-laden Western outing Riding With Buffalo Bill. He was cast as frontier prospector Rocky Ford, a talkative, opinionated, but shrewd old-timer who was nominally a sidekick but who really served as the chief coordinator of all the good guys’ activities. Fawcett’s Rocky talked heroes Bill Cody (Marshall Reed) and Reb Morgan (Rick Vallin) into jointly assuming the identity of a once-famous masked hero called the Ridin’ Terror, and then orchestrated their campaign against an outlaw gang, providing them with backup when they needed it; it was eventually revealed that the original Ridin’ Terror had been none other than Rocky himself. 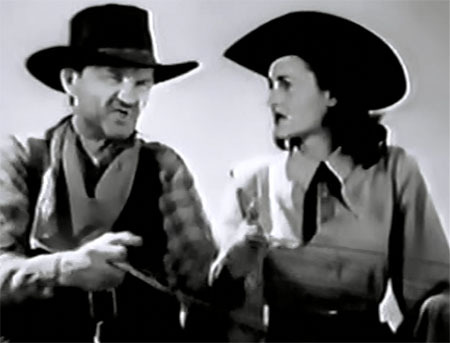 Above: William Fawcett displays unexpected gallantry when introduced to Shirley Whitney in Riding With Buffalo Bill (Columbia, 1954). Marshall Reed is on the right. In 1955, Fawcett landed a major supporting role as crusty but affable ranch-hand Pete Wilkey on the popular boy-and-his-horse TV show Fury; he stayed with the series for its entire five-season run, while making many appearances on other shows and (less frequently) popping up in movies–among them No Time For Sergeants, in which he played the father of Andy Griffith’s character in the opening sequence. He finished his stint on Fury in 1960, but continued to work steadily as a character actor in television and in occasional features throughout the 1960s and into the early 1970s, almost always playing peppery old Westerners. He retired in 1972, and died two years later at his home in Sherman Oaks, California. One of the only serial character actors to enter the Hollywood scene after World War 2, William Fawcett possessed a screen presence quite as vivid as those of Ernie Adams, Tom London, and other chapterplay veterans whose filmographies stretched back to the silent-film era. Though most of his chapterplays were quite uneven in quality, his cantankerous, crafty, and colorful characterizations were invariably interesting and enjoyable. 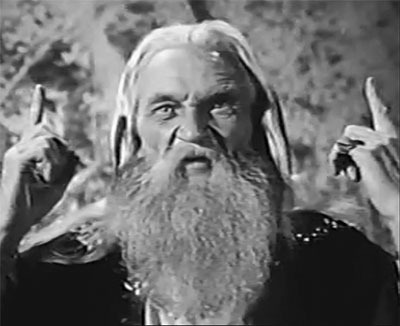 Above: William Fawcett as the spell-casting Merlin in The Adventures of Sir Galahad (Columbia, 1949). Acknowledgements: I am indebted to the page on Fawcett at Boyd Magers’ Western Clippings website, and to the Fawcett page at the Broken Wheel Ranch website (a site devoted to the Fury TV show–no longer maintained, but still available on the web). I enjoyed watching William Fawcett as Pete Wilkie in the Fury TV series, it was one of his best roles. Living in the Midlands area of Great Britain, we had plenty of re-runs, thank goodness.